Corvette Z06 in Ybor City near train tracks Tampa Car Photography - Nikon D300 Tamron 17-50mm @ f/8 ISO 200 1/30th +1 ev tripod mounted single exposureDustin contacted me about photographing his 2004 Corvette Z06 in the same Ybor City Tampa location he has seen my photographs of a Mustang and a Lexus IS F. He was open to me shooting however I liked, not wanting any replicated photos and I really wanted to try and produce some different shots after having already shot at this exact spot twice before. 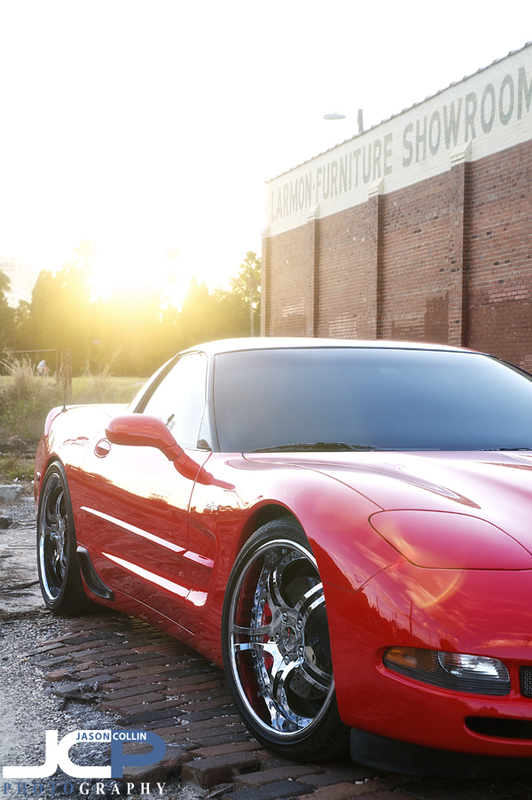 Thanks to our well timed shoot and Mother Nature cooperating with a very well positioned sunset, I was able to produce some new shots for this Corvette shoot. Red Chevy Corvette Z06 sunset view in Ybor City Tampa Car Photography - Nikon D300 Tamron 17-50mm @ f/8 ISO 200 1/40th +2 ev tripod mounted single exposureOne of the big differences with the shots from this car photography shoot was I did not rely on HDR for most of the shots. I still shot a majority of bracketed shots, but I ended up using one of those exposures, as in the shot above, to produce the final image. I feel this improves my car photography shooting style offering future clients even more variety in final images. What motivated me to shoot like this? Looking at lots of photographs of cars on Autoblog.com. Looking at photographs is a great way to improve your own photography, no matter what you are shooting or what experience level you are. Corvette Z06 vs train in Ybor City Tampa Car Photography - Nikon D300 Nikkor 50mm @ f/4 ISO 200 1/400th with antique filter in Silver Efex ProOne of the original reasons I scouted this Ybor City shooting location was that the client wanted to have his car near train tracks. Well these tracks are very active as you can see above allowing me to make a "Corvette vs. Train" shot. I wonder what the train engineer was thinking? 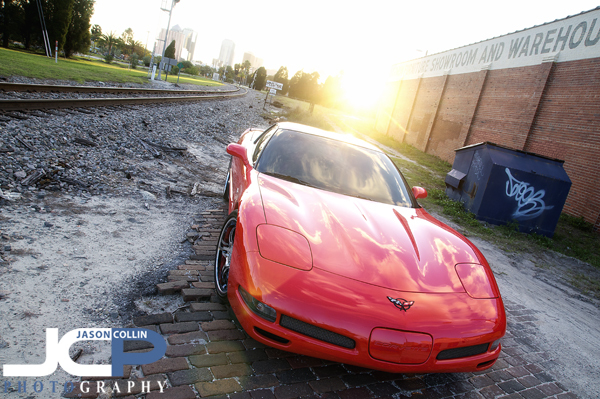 Z06 Corvette train track sunset in Ybor City Tampa Car Photography - Nikon D300 Tamron 17-50mm @ f/8 ISO 200 9-exposure HDR tripod mounted with cable releaseI still did make some 9-exposure HDR final images though, like the one above allowing me to show the full details of the red Corvette and full detail in the bright sky background. As you can see in the shots above, with a single exposure that much detail in the sky cannot be preserved unless you make an HDR image. Corvette Z06 in Ybor City at sunset Tampa Car Photography - Nikon D300 Tamron 17-50mm @ f/8 ISO 200 9-exposure HDR tripod mounted with cable releaseMost car shots are usually from a low angle, but I wanted to show more of the shape of the hood of this Corvette so I maxed out the leg height of my tripod to get this upper view of the car and used another 9 exposures to make this HDR image. 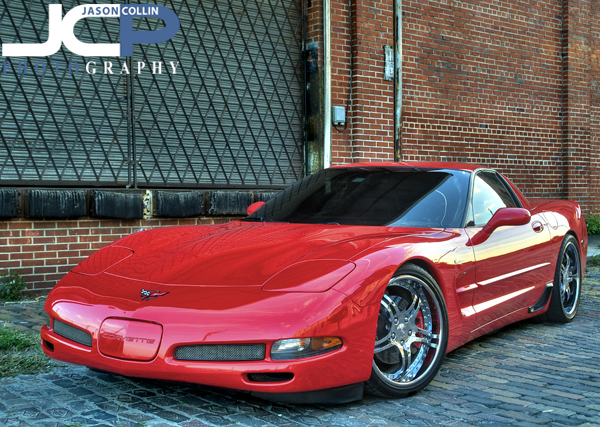 Stylized Corvette Z06 view in Ybor City Tampa Car Photography - Nikon D300 Tamron 17-50mm @ f/8 ISO 200 1/100th +2 ev tripod mounted single exposureA tight rear quarter panel and rear wheel composition is one of my favorite views to photograph a car from, as seen in the photo above. I think it creates a somewhat exaggerated and therefore interesting view of a car, especially if it has nice wheels! 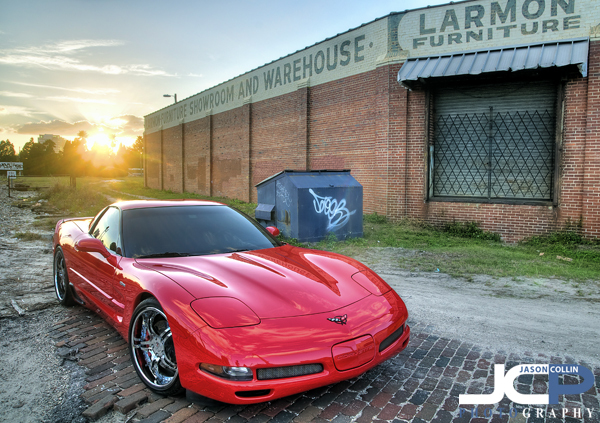 Corvette Z06 on bricks in Ybor City Tampa Car Photography - Nikon D300 Tamron 17-50mm @ f/8 ISO 200 9-exposure HDR tripod mounted with cable releaseFor the last shots of the afternoon we went to the other side of the warehouse out of direct sunlight. Even though there was no bright sky to contend with, I chose to shoot in brackets and ended up using all 9-exposures to make the HDR image above. In doing so details in the shadows of the car and gate above were revealed.